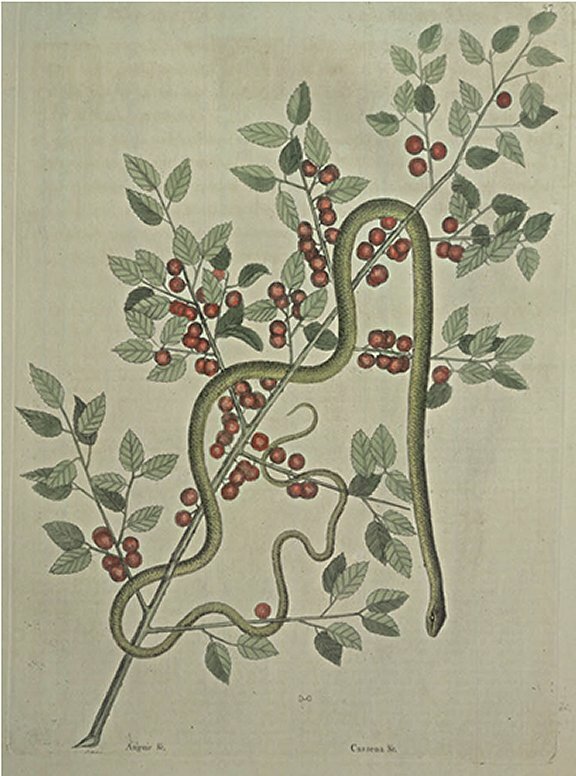 This inoffensive little Snake abides among the Branches of Trees and Shrubs, catching Flies and other Insects, on which they feed: They are generally about the Size of the Figure; they are easily reclaimed from their Wildness, becoming tame and familiar, and are very harmless, so that some People will carry them in their Bosoms. This Shrub usually rises from the Ground with several Stems, to the Height of twelve Feet, shooting into many upright slender stiff Branches, covered with whitish smooth Bark, set alternately with small evergreen serrated Leaves, resembling those of Alaternus: Its Flowers are small, white, and grow promiscuously amongst the Leaves, and are succeded by small spherical Berries on short Footstalks; these Berries turn red in October, and remain so all the Winter, which with the green Leaves and white Bark makes an elegant Appearance. But the great Esteem and Use the American Indians have for it, gives it a greater Character. They say, that from the earliest Times the Virtues of this Shrub has been known, and in Us among them, prepared in the Manner they now do it, which is after having dryed, or rather parched the Leaves in a Porrage-Pot over a slow Fire, they keep it for Use: Of this they prepare their beloved Liquor, making a strong Decoction of it, which they drink in large Quantities, as well for their Health as with great Gust and Pleasure, without any Sugar or other Mixture, yet they drink and disgorge it with Ease, repeating it very often, and swallowing many parts. They have an annual Custom in the Spring of Drinking it with Ceremony, the Town having notice from the King or principal, the Inhabitants assemble at the Town-House having previously by Fire purged their Houses of all their old Furniture, and supplied them with new, the King is first served with a Bowl or Conch-shell never used before of this emetick Broth, by the next to him in Eminence, and he by the next is served, and so on till he comes to the Women and Children: They say it restores lost Appetite, strengthens the Stomach, giving them Agility and Courage in War, &c. It grows chiefly in the Maritime Parts of the Country, from whence those Indians supply the Mountain Indians with it, carrying on the like Trade with it in Florida, as the Spaniards do with the South-Sea Tea from Parraguay to Buenos-ayres; Florida being in the same Latitue Norh, as Parraguay is South; and observing by comparing the Leaves of both, no apparent Difference in them, induces me to believe they are both the same Plant. In South Carolina it is called Cassena. In Virginia and North Carolina it is known by the Name of Yapon, in the latter of which Places it is as much in Use among the white People as among the Indians, at least among those who inhabit the Sea Coasts.